The mission of the Quebec Network for Research on Aging is to support interdisciplinary research on aging and to promote the maintenance of a critical mass of researchers, help increase overall research capacity, and stimulate the creation of research partnerships in this field. The Network’s ultimate goal is to increase knowledge about the biological, clinical, populational, social, and societal aspects of aging. 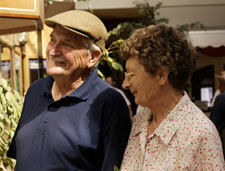 This knowledge can then be used to help promote successful aging, to prevent or delay the expression of the components of frailty and its harmful effects, and to improve the health care and services provided to the elderly. 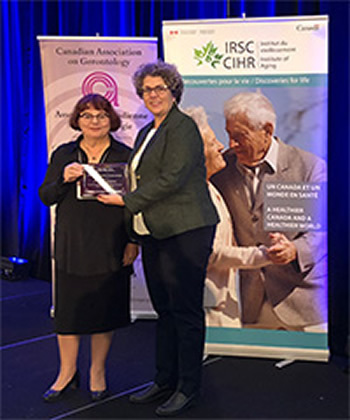 On October 20, 2018, Pierrette Gaudreau was awarded the Contribution to Gerontology Award by the Canadian Association on Gerontology (CAG). The honorary plaque was presented by Professor Suzanne Dupuis-Blanchard, President of the CAG, at the organization's 47th Annual Scientific and Educational Meeting. This mark of recognition is shared with all members of the Network. Geroscience: A novel interdisciplinary approach for research on aging. The 15th edition of the Quebec Network for Research on Aging Research Days, held on October 1 and 2 at Université Laval, was a great success with the participation of 135 students, researchers and health professionals. The Café Scientifique "En forme après 50 ans – bouger pour ne pas rouiller" organized on October 1 by the RQRV Student Committee attracted approximately 100 well-informed seniors! Consult Professor Carol Hudon’s presentation, which is an impressive example of spin-offs of the structuring actions; that of Mr. Paul l'Archevêque, Director of l'innovation au Ministère de la Santé et des Services Sociaux du Gouvernement du Québec, as well as the list of Recipients of the Awards of Excellence for oral and poster presentations. The directorate of the Quebec Network for Research on Aging (RQRV) would like to take this opportunity to thank all the speakers, the session presidents, and the evaluators for the oral and poster presentations. Save the dates, October 1 and 2, 2019 – the Quebec Network for Research on Aging Research days will be held at the CHUM Research Center. The submission deadline for the next competition is 31/05/2018. Only original articles published between 01/04/2016 and 31/03/2018 are eligible. Discover our new RQRV Student Committee Facebook page. A new approach to networking. The RQRV's partnership with the Optimal Aging Portal (McMaster University, ON) is realized by the launch of the french McMaster Optimal Aging Portal. This opens up a new window of international outreach. Listings of neuropsychological tests with French-Quebec standards developed by the team of professors Joël Macoir and Carol Hudon from Université Laval. This scientific contribution has been financially supported by the Network. We are very proud to announce that our evaluation is very positive and that we have obtained the maximum grant available under this program, $ 800,000 / year for the period 2017-2021. This will enable us to implement our new strategic and scientific programming. We would like to express our gratitude to the Network's student members and researchers who are a big part of this success, as well as the Thematic Group and Platform Coordinators who have worked hard to produce a high quality scientific activity report and scientific program.